Should I be concerned about lead in candles? Most U.S. candle manufacturers stopped using wicks with lead or lead alloy cores 30 years ago. If you are concerned whether the wick in a candle contains lead, snip a piece of unburned wick, remove the wire core and rub it across a sheet of paper. Lead wicks will write like a pencil, while all cotton or safe zinc core wicks will not. 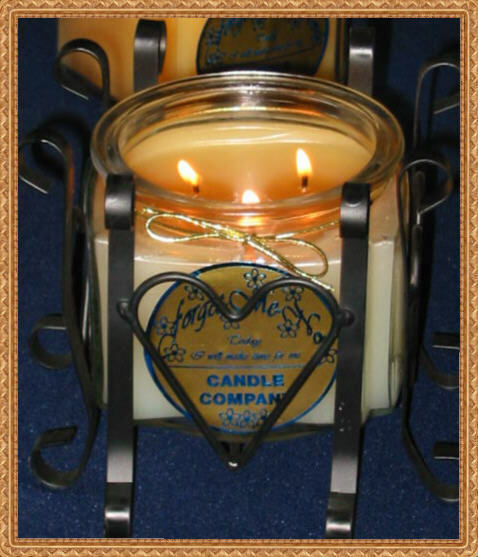 Forget-Me-Not Candle Co. has never used lead or lead alloy core wicks. Our wicks contain a zinc core which is safe when burned following the below directions. 1.) It is crucial to trim your wicks back leaving 1/4 an inch before you ever light your candle. The candle does not come pre-trimmed! Lighting the wicks before trimming them back can cause a huge flame resulting in a possible fire hazard, extreme smoking and damaged faulty wicks that will never burn right again. 2.) Forget-Me-Not Candles are constructed to burn evenly, preventing the thick layer of wax that forms around the outside of the jar like other candles. For maximum usage, allow wax to burn at least 3-4 hours during each burn. 3.) Handle with care, as the container is fragile. Do not use if jar is cracked, chipped or scratched. 4.) Place on protected, heat resistant, dry surface, well away from anything flammable, and out of the reach of children. Do not place on glass surfaces! 5.) Do not allow flame to directly touch side of glass container. Keeping wicks trimmed and centered will help prevent this. 6.) Sides and bottom of container may become hot while candle is burning. Please handle carefully. 7.) Discontinue use when 1/2" of wax remains. This will prevent possible heat damage to the counter surface or the container itself. 8.) Extinguish candle before replacing lid. You may dip the wicks into the wax to prevent smoking. 9.) Store in a cool, dry place. Exposure to moisture might inhibit relighting. Color, fragrance and specific usage affect wax consumption. It is normal for a thin layer of wax to be left lining the edges of the container. 10.) If mushrooming or smoking appears, please blow out the candle, cut wicks back down to 1/4 inch. You may re-light or let solidify. 11.) Please note that cutting your wicks to short can also cause the candle not to burn correctly. If your burn pool is putting out the flames, your wicks have been cut to short resulting in the flame not staying lit. If this happens, you will need to contact FMNCC for safe recommendations in removing some of the wax. 12.) Please do not trim wicks by using your fingernails. This method leaves the zinc part of the wick intact and will cause the wick to smoke next time it is lit. You may use special wick trimming tools or I suggest a large pair of toenail clippers works great.